I’ll have the honor of hosting SurgeXperiences for the fourth time on Sunday, March 15th. SurgeXperiences is the one and only blog carnival collecting blog posts on all things surgical. Please send me your posts via this form by Friday, March 13th. 1. the branch of science concerned with the bodily structure of humans, animals, and other living organisms, especially as revealed by dissection and the separation of parts. 2. a study of the structure or internal workings of something: a detailed anatomy of a society and its institutions. – origin late Middle English: from Old French anatomie or late Latin anatomia, from Greek, from ana- ‘up’ + tomia ‘cutting’ (from temnein ‘to cut’). Edition 218 will be up at scanman’s notes on March 1st. Peter and Nelly Block with their twin daughters. Photo: Keith Weller © Johns Hopkins Magazine. Just read a brilliant article from a 2005 issue of the Johns Hopkins Magazine, describing an operation to separate two conjoined twins. Full of suspense and surgical insight, it is one of the most well written descriptions of surgery I’ve ever read. It had me on the edge of my seat and, being a father myself, it almost moved me to tears. It’s a detailed deconstruction of the difficult steps in a 30 hour long operation to separate the two 10 month old twin girls. Like no other piece I’ve read, it puts across an understanding of the important tasks of all the professions in the surgical team, from the scrub tech to the anesthesiologist. Read it! Thanks to T for the tip. The Wellcome Library, which catalogues books, manuscripts, archives, films and pictures on the history of medicine, has started to make their historical medical films available on YouTube. Over 100 hours of historical films and video is going to be digitized. As of now, 25 videos have been published, the subject matter ranging from public health information on obesity in children to descriptions of surgical procedures, like the removal of a tuberculoma of the brain, shown above. A great source of both medical history and the history of visual communication in medicine! Thanks to Thomas for the tip. My Canon 5D MkII mounted on a DV Rig Pro. Photo by Øystein Horgmo © All rights reserved. Organs removed in the Whipple procedure. Lego Mini Fig Anatomy by Jason Freeny ©. Click for larger image. This is the coolest piece of art I’ve seen in a long time! 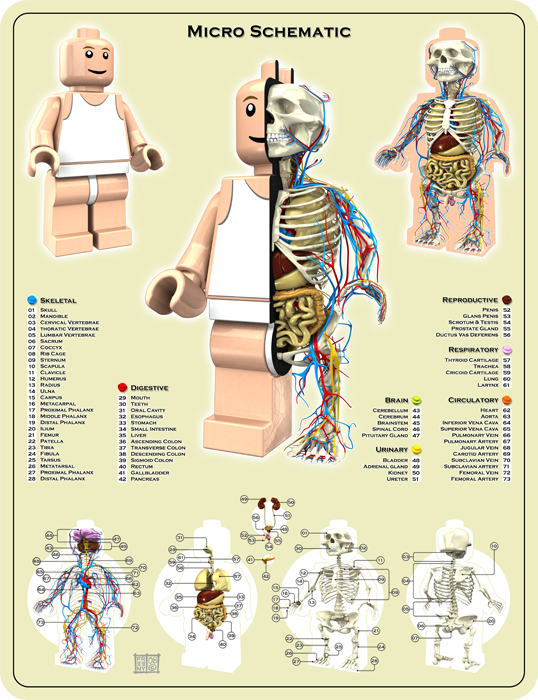 The Lego anatomy schematic is one of several brilliant anatomy designs by New York artist Jason Freeny. Details of the schematic can be viewed on his blog. High quality prints can be ordered here. I know I will! You are currently viewing the archives for February, 2009 at The Sterile Eye.